Open plan offices can range from short-walled cubes to cavernous rooms filled with long tables and rolling office chairs. 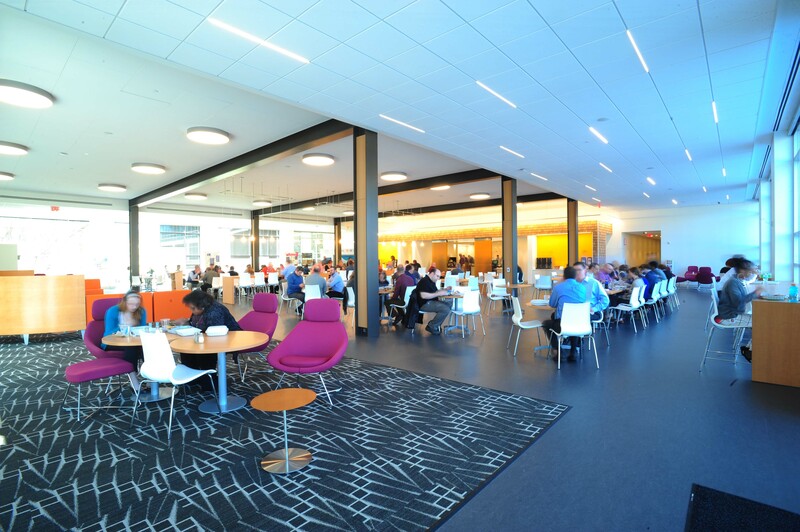 A properly designed open space can break down departmental silos, foster collaboration, empower employees and keep down costs. Thanks to these advantages they are a very popular form of office design. In 2017, around 70 percent of the offices in the US (ours included) were open plan offices with low or no partitions. However, working in an open office space can be a little like signing a lease with 250 roommates. World Cup watch parties are amazing (shout out to our French colleagues) but making sure the place isn’t a constant disaster takes everyone pitching in. We know a bit about this. 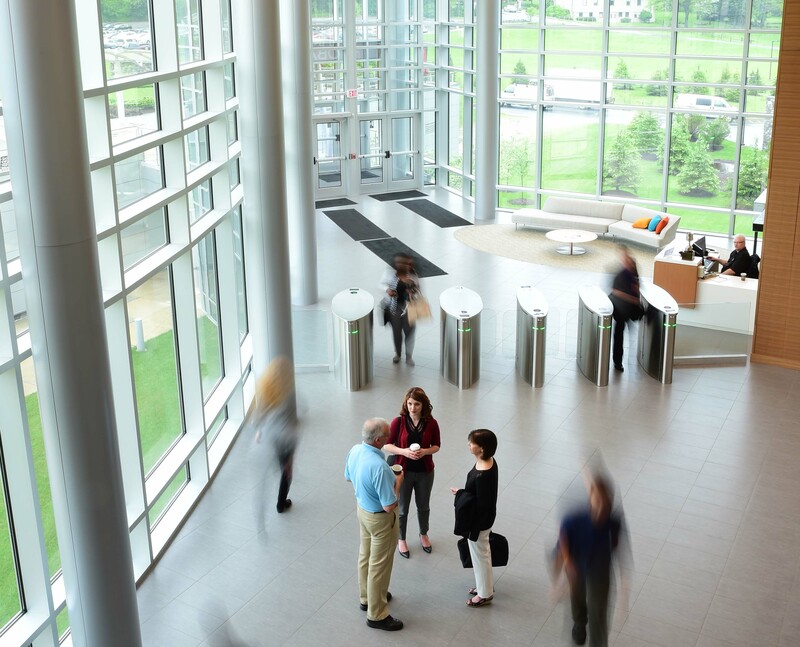 On October 15, 2015, we opened a new state-of- the-art corporate headquarters in Malvern, Pennsylvania. The 277,000-square-foot building, houses 800 employees and features an open plan office design. Besides just being a beautiful facility (you can see pictures here) and a great place to work it serves a secondary function as well – that of Living Laboratory. It was specially designed to measure the effects of Multi Comfort strategies and open workplace design on occupant comfort, health, well-being and productivity. 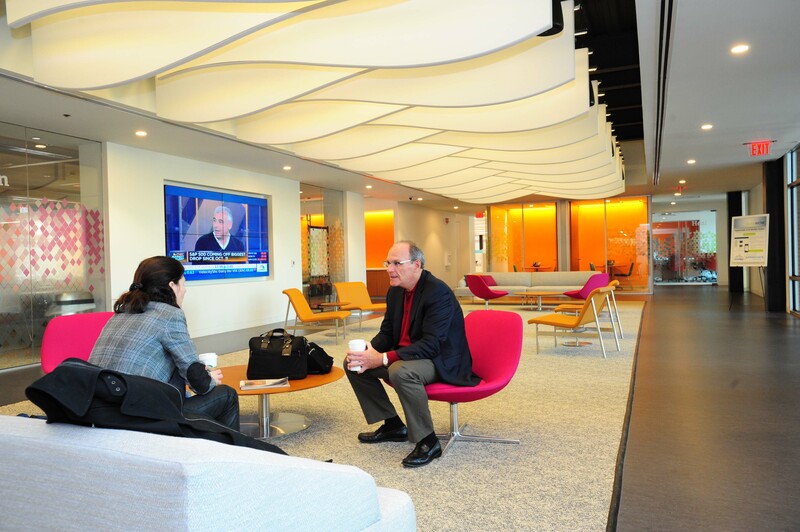 Our office space was designed to be able to measure environmental impact on employee productivity. After three years of data collection in partnership with the University of Oregon’s High Performance Building Lab, we have released our first round of results. The research covers a lot about the buildings’ effects on its occupants but I was curious about occupants’ effects on the workplace environment. So, to get a better understanding how we as employees can be better citizens of the open plan, I spoke with Lucas Hamilton, our Manager of Building Science and all around building wizard. Hamilton worked closely with the builder and architect team to design the new HQ so he knows a thing or two about making an open plan office work for the employees. When it comes to your work day experiences there are five main factors that influence your productivity and satisfaction. Let’s look at each one and see why it matters and how understanding it can improve your work days. While open-concept workspaces provide many benefits, they can pose challenges for workers in need of peace, quiet and privacy. In any workplace, noise from coworkers, building systems or traffic outside can make it harder for employees to concentrate and complete tasks. Acoustical comfort tip #2: Take your cellphone when you go. Invest in noise cancelling headphones. They work wonders to temporarily block out external distractions. Silence your electronics. There is enough noise in an open office without every laptop and phone pinging, buzzing or beeping at every email, text and meeting reminder. Take your cell phone when you go. Don’t leave your cell phone unattended at your desk. No one wants to hear your alarm or phone ringing unanswered. If you are going to leave it, simply silence the ringer. Grab your computer and seek out a quiet corner or unused office space. If you are in an open office plan and are in need of some quiet, sometimes you just need to move. Focus on the task at hand then, when it is complete rejoin the group. Read the silences. On the flip side, be cognizant of coworkers in the zone. Head down, earphones on probably means they don’t want to discuss last night’s game or answer that question right now. Often one of the benefits of an open office floor plan is the access to natural light and views. Both have been shown to improve occupant comfort and productivity. 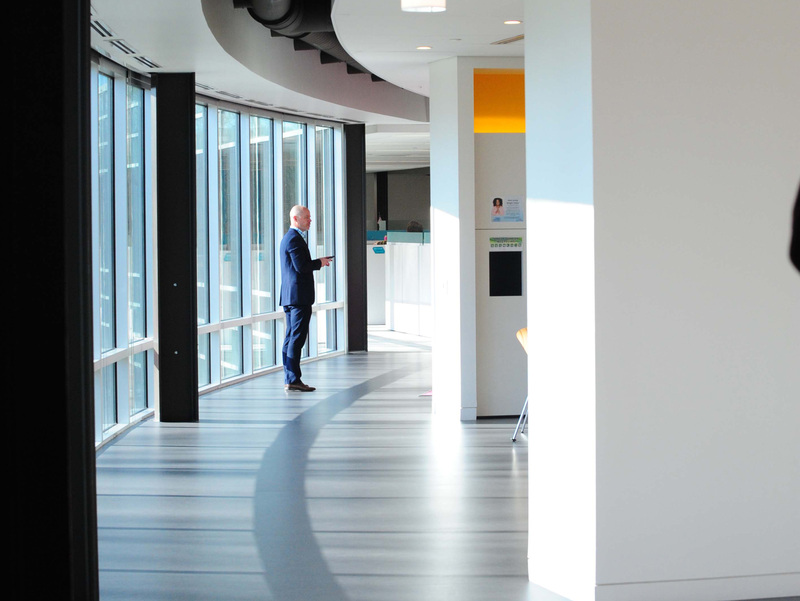 When we moved to our new headquarters which offers sweeping outdoor views of nature from 92 percent of the interior space, our employees reported a 56.4 percent overall improvement in visual comfort. Visual comfort tip #1: Find a view of trees or sky. Find a view outside. If your office space doesn’t offer ready views of the outdoors, make it a point to take regular trips to a window or go for a short walk outside – anywhere offering views of sky and trees. Be respectful of the windows. In order to take advantage of natural light you need to let it in. Blocking windows with whiteboards and flip charts minimizes what is often one of the great benefits of the open office plan, the views. Hamilton says this advice goes for facility managers, too. “The office layout needs to consider the windows from the beginning.” He suggests orienting the aisles to provide unobstructed visual access to the outdoors and don’t place higher walled cubicles next to the windows. Even if those requests come from individuals above your pay grade. One of the touted benefits of the open plan is equalizing the workforce playing field and this goes for office location too. Embrace the white. Be aware of white reflective surfaces around the office. These spaces are not just a nod to Swedish modern design that seems to be all the rage in contemporary office design, they also serve an important light function. These shiny surfaces are used to reflect and bounce natural light into the interior of the building. Keep them clear of excessive pictures, posters and other motivational decor and your eyes will thank you. Thermal comfort is a dynamic quality of the built environment comprising variables such as airflow velocity, air and radiant temperatures, relative humidity, and occupants’ capacity to make adjustments to their surrounding climate. The human body responds to all of these conditions to regulate heat distribution and maintain comfort. Improving indoor air quality (IAQ) is a subtle balance of proper ventilation rates, managing volatile organic compounds, air temperature, humidity levels, and airborne particulates. Minimizing air borne contaminants can have a real effect on occupant health and well-being and requires constant vigilance. We bring VOCs and contaminants along every time we walk into the building but extra attention to this issue can yield great rewards. After taking calculated measures to improve air quality in our new headquarters, we found a significant decrease in formaldehyde levels as well as fungal spore counts when compared to both our old offices and the outdoor environment. As a result, seasonal allergy sufferers found relief by coming into work. Air quality tip #2: Take your lunch to the cafeteria. Choose low or no emitting materials to maintain your habitat. This goes not only for the materials you choose to construct your world but also what you use to maintain it. If they don’t already exist, work with your facilities depart to draft and enact sustainable purchasing guidelines that include an emphasis on using materials and cleaning products that are also low or no emitting. Even better, Hamilton says, choose products like VOC sequestering gypsum board to help manage what sneaks in. Take your lunch to the kitchen. If your lunch has an aromatic quality like last night’s fish and brussel sprouts, take it to a cafeteria or kitchenette to reheat and eat. Kitchen areas are often equipped with exhaust fans and extra ventilation that helps the air in these areas turn over faster than in other areas. As a result, odors will not linger for nearly as long. Keep it light. When it comes to perfumes, lotions and colognes, keep the scents subtle and light. Most offices do not have windows that can be opened or fans to dissipate smells. Take away the trash. Like with lunches, in shared spaces you need to be aware of what you are throwing away. Many companies, (we do!) limit your in work space waste options to paper or other recyclables. Non-recyclable materials, trash, need to be carried and disposed of in designated areas often away from communal working spaces. This is not only environmentally responsible, it helps remove perishable trash items to concealed and contained trash receptacles keeping workspaces free of lingering odors, insects and other unwanted visitors. Productivity in an open office space, like any office space, often lies somewhere in the balance between collaboration and concentration. In traditional office plans the onus is on employees to move beyond physical barriers in order to foster collaboration. In an open office plan, there needs to be a focus on respecting boundaries where physical barriers may not exist. Begin with an agreement that everyone has a right and a need to work and succeed in order to provide for themselves and their family and good things will surely result. Courtesy and respect tip #3: Take vendors out of the work space. Acknowledge the invisible lines. In the absence of physical boundaries, when in doubt behave as if they were there. Courteously announce yourself and ask if you may interrupt. Do not “sneak up” on coworkers. No one likes that. Pay attention to your phone. Expecting a phone call? Try to answer it on the first ring and keep the ringer volume set to a low level or on vibrate. Dialing into the 3:00 conference call? Be aware of others working around you. Keep your head and voice down and don’t use the speaker function. The partition will help block the sound of your voice and keep it from echoing around the office floor. Even better? Consider reserving a meeting room especially if you are anticipating being an active participant. More than two is too many. Don’t bring customers, vendors, or outside parties into your workstation; instead schedule a conference space. In general, if more than two people are meeting, consider moving to a collaborative space. A good rule of thumb—if you feel you need to raise your voice to be heard, move. Stay in your lane. Hearing a conversation isn’t necessarily an invitation to join it. Don’t join in unless invited. The open environment empowers staff to offer support to one another and share and uphold accountability, encouraging innovation and productivity in a strong workplace culture. Plus, it is a lot of fun, but to work properly everyone needs to pitch in and practice a few basic courtesies.